Fabrice Danniel is Vice-Director of Culinary Arts and Director of Operations. He works alongside the Institute’s Executive Chef and Culinary Arts Director Eric Briffard. Chef Danniel has been with Le Cordon Bleu International for more than 10 years. With extensive international experience and in-depth knowledge of culinary industry education, Chef Danniel divides his time between France and Thailand, where he is currently Technical Director of Le Cordon Bleu Bangkok and a consultant for Le Cordon Bleu in Asia. Born in Antibes, Fabrice Danniel was awarded his “Certificat d’Aptitude Professionnelle (CAP)” in pastry in 1985. He then went on to develop his skills by working in a number of prestigious restaurants in France and the Middle East before becoming pastry Chef in a variety of hotels and Michelin-starred gastronomic restaurants such as the Martinez Hotel in Cannes, and restaurants in Paris such as Henri Faugeron, Lucas Carton and Le Pavillon Elysée Lenôtre. Chef Danniel then continued his career internationally, firstly at the Restaurant de l’Hôtel de Ville, under Chef Freddy Girardet in Crissier, Switzerland. He then spent three years in Lebanon as pastry Chef at the luxury hotel Les Suites, which boasted three restaurants. 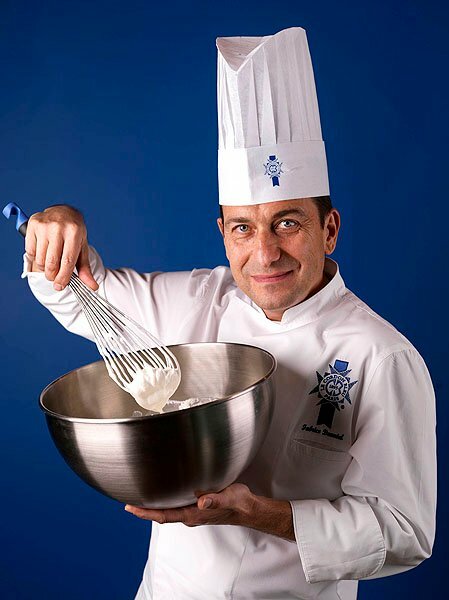 In 1997, he continued his training, developing a number of fields of expertise and techniques with his “Brevet de Maîtrise en Pâtisserie, confiserie, chocolatier, glacier” (Master of Pastry, confectionery, chocolate and ice cream). Chef Danniel then started working at Napoléon, and was transferred to Cairo, Egypt, to set up a lab for producing fine pastries. He then went on to become pastry Chef at the Sheraton Doha Resort hotel restaurant in Qatar. Chef Danniel joined Le Cordon Bleu Paris team of Chef Instructors in 2003 and has traveled to many countries to represent the institute. In 2006, he moved to Bangkok, Thailand where he was responsible for the pre-opening of Le Cordon Bleu Dusit Culinary school.